Token, Token, Who has a Token? War rationing affected every family throughout the US and these little red and blue tokens became a way of life on the home front. A complete pictorial reference of the OPA Tokens available for collecting today. Spain: Day 39 of 985 of the Spanish Civil War. Philippines: President Manuel Quezon grants Douglas MacArthur the title of Field Marshal in the Philippine Army. Spain: Day 404 of 985 of the Spanish Civil War. The Republican Army launches an offensive into Aragon from Catalonia with the objective of capturing Saragossa. They will push back the Nationalist forces over the course of the next month, but will be unable to dislodge them nor to capture any important towns in the area. CBI - China: Day 49 of 2,987 of the 2nd Sino-Japanese War. Day 12 of 106 of the 2nd Battle of Shanghai. Three Chinese transports and eight captured Japanese transports are sunk at the mouth of the Yangtze River at Jiangyin, adding more obstacles to prevent Japanese navigation. Spain: Day 769 of 985 of the Spanish Civil War. CBI - China: Day 414 of 2,987 of the 2nd Sino-Japanese War. Day 75 of 139 of the Battle of Wuhan. Japanese troops capture Ruichang. UK: The United Kingdom enacts emergency powers and partially mobilizes the British military in preparation of war with Germany. CBI - China: Day 779 of 2,987 of the 2nd Sino-Japanese War. CBI - Mongolia: Day 106 of 129 of the Battle of Khalkhin Gol, a border dispute between the Soviet Union and Japan. ETO - UK: Day 46 of 114 of the Battle of Britain. 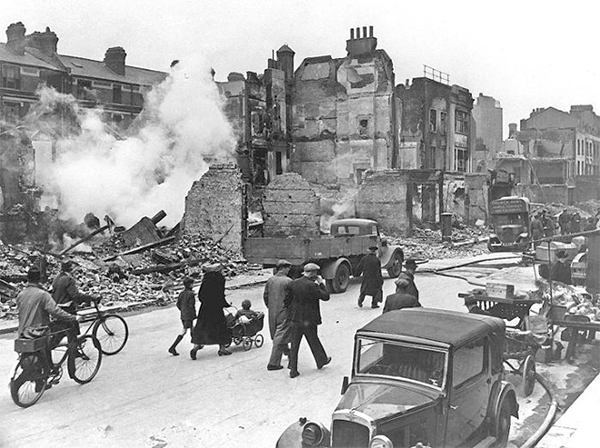 Fate takes a turn when a lost formation of German bombers mistakenly drops their bombs over residential areas of London, damaging St Giles and Cripplegate. This will change the rules of war regarding bombing, as private citizens will now become "fair game" for Allies and Axis alike. ":The other night the English had bombed Berlin. So be it. But this is a game at which two can play. When the British Air Force drops 2,000 or 3,000 or 4,000 kg of bombs, then we will drop 150,000, 180,000, 230,000, 300,000, 400,000 kg on a single night. When they declare they will attack our cities in great measure, we will eradicate their cities. The hour will come when one of us will break - and it will not be National Socialist Germany!" Germany didn't know at the time just how weak the RAF had become, nor how close it was to being completely destroyed. When the Luftwaffe switched their focus to bombing British cities, it was a blessing in disguise, giving the RAF time to rebuild, regroup and refortify. ETO - Germany: During the night, the RAF makes a retaliation bombing strike on the general population of Berlin. Atlantic: German sub U-57 sinks the British ships SAINT DUNSTAN and CUMBERLAND 2 miles north of Ireland. U-48 sinks the British tanker LA BREA 130 miles west of the Outer Hebrides, Scotland. 500 miles west of Ireland, U-37 sinks the British ship BROOKWOOD and later on during the night U-37 sinks British sloop HMS PENZANCE. East Africa: Day 76 of 537 of Italy's East African campaign in the lands south of Egypt. German armed merchant cruiser ATLANTIS sinks the British ship KING CITY 900 miles east of Madagascar. CBI - China: Day 1,145 of 2,987 of the 2nd Sino-Japanese War. Day 284 of 381 of the Battle of South Guangxi. Day 5 of 42 of the Hundred Regiments Offensive. UK: Winston Churchill warns Japan that its aggression must stop. ETO - France: Vichy France passes new anti-terrorist laws, punishable with death sentences, to deal with the resistance movement. ETO - France US 8th Air Force B-17s bomb the shipyard at Le Trait. Germany: Adolf Hitler orders the end of the euthanasia program that had already killed 70,273 mentally-ill people. However, some doctors will continue to kill the mentally-ill until the end of the war. Russian Front - Finland: Day 57 of 142 of Operation SILVER FOX, a joint German-Finnish campaign to capture the Russian port of Murmansk in the Arctic. Russian Front - Finland: Day 55 of 140 of Operation ARCTIC FOX, a joint German-Finnish campaign against Soviet Northern Front defenses at Salla, Finland. Russian Front - Finland: Day 64 of 164 of the Battle of Hanko. Russian Front: Day 64 of 167 of Germany's Operation BARBAROSSA, the invasion of the USSR. Russian Front - North: German Army Group North continues encircling Leningrad. The Soviets launch a new offensive in the Leningrad area. Russian Front - Center: Day 8 of 23 of the Battle of Dukhovshina, Russia. Russian Front - Center: Day 32 of 38 of the Battle of Gomel, Belarus. The Soviets launch a counter-attack in the Gomel sector near Idessa, inflicting heavy losses on the Romanian troops. Russian Front - South: Day 2 of 35 of the 1st Battle of Kiev, Ukraine. German Army Groups South and Centre launch an attack on Kiev. Russian Front - South: Stalin orders that Stalingrad is to be held at all costs. Russian Front - South: Day 17 of 70 of the Siege of Odessa, Ukraine. MTO - Libya: Day 137 of 256 of the Siege of Tobruk. East Africa: Day 441 of 537 of Italy's East African campaign in the lands south of Egypt. CBI - China: Day 1,510 of 2,987 of the 2nd Sino-Japanese War. Russian Front - North: Day 351 of 872 of the Siege of Leningrad. Russian Front - North: Day 112 of 658 of the Siege of the Kholm Pocket. Russian Front - Center: Day 26 of 64 of the 1st Battle of Rzhev-Sychevka, Russia. Russian Front - South: Day 2 of 165 of the Battle of Stalingrad, the bloodiest battle in human history. Russian Front - South: Day 58 of 150 of Germany's CASE BLUE. MTO - Libya: US B-24s attack the harbor at Tobruk. East Africa: Day 112 of 186 of the Battle of Madagascar. CBI - China: Day 1,875 of 2,987 of the 2nd Sino-Japanese War. Day 102 of 124 of Japan's Zhejiang-Jiangxi Campaign, launched to punish anyone suspected of aiding the Doolittle raiders in China. Roughly 250,000 Chinese will be killed. PTO - Alaska: Day 79 of 435 of the Battle of Kiska, Aleutian Islands. PTO - Malaya: Day 187 of 357 of the Battle of Timor Island. PTO - New Guinea: Day 35 of 119 of the Battle of the Kokoda Track. US 5th and 13th Air Forces provide air support. About 1,000 Japanese reinforcements land at Milne Bay and meet great resistance by the Allied defenders. PTO - Solomon Islands: Day 1 of 2 of the Naval Battle of the Eastern Solomons. The Japanese try to land more reinforcements on Guadalcanal but, are discovered and driven off by the US Navy and Marines. The US sinks the carrier RYUJO but suffers damage to their own carrier USS ENTERPRISE. PTO - Solomon Islands: Day 18 of 187 of the Battle of Guadalcanal. US 5th Army Air Force provides air support. Marine fighter planes based at Henderson Field join in on the Battle of the Eastern Solomons. ETO - France: America's future top scoring fighter Ace "Gabby" Gabreski gets his first of 28 kills in the European Theater. 27 Jun 44: Ties record with Bob Johnson in "ace race"
ETO - France: US 8th Air Force B-17s bomb an air depot and airfields in France. Germany: Heinrich Himmler becomes Germany's Minister of the Interior. Poland: 1,260 Polish Jewish children from the liquidated Bialystok ghetto arrive at the Theresienstadt Concentration Camp. Russian Front - North: Day 716 of 872 of the Siege of Leningrad. Russian Front - North: Day 477 of 658 of the Siege of the Kholm Pocket. Russian Front - Center: Day 8 of 48 of the Battle of Bryansk, Russia. Russian Front - Center: Day 18 of 57 of the 2nd Battle of Smolensk, Russia. Russian Front - South: Day 1 of 122 of the Battle of the Lower Dnieper River in Russia. Russian Front - South: Day 43 of 48 of the USSR's Lvov-Sandomierz Offensive. MTO - Italy: The Allied Air Forces attack targets at Castrovillari and Sibari. CBI - China: Day 2,240 of 2,987 of the 2nd Sino-Japanese War. US 14th Air Force bombs the airfields at Hankow and Wuchang. PTO - New Guinea: Day 125 of 148 of the 2nd Battle of Lae-Salamaua. US 5th and 13th Air Forces provide air support. PTO - Solomon Islands: Day 66 of 67 of the Battle of New Georgia. US 5th and 13th Air Forces provide air support. PTO - Solomon Islands: Day 10 of 56 of the Battle of Vella Lavella. US 5th and 13th Air Forces provide air support. ETO - UK: Day 73 of 86 of the V-1 "Buzz Bomb" offensive on Britain. ETO - France: German troops stage a comeback in Paris with fierce fighting being reported. German troops evacuate Bordeaux and take up fortified positions on the Gironde River outside the city. ETO - France: Day 24 of 284 of the Battle of Brittany. ETO - France: Day 10 of 32 of Operation DRAGOON, the Allied invasion of southern France. Allied troops continue racing up the Rhone Valley. Allied troops liberate Cannes. ETO - Germany: The RAF night bombs Berlin. A blanket of smoke covers Berlin to a height of 20,000 ft. First estimates put the German civilian death toll at 5,860 after last night's raid. ETO - Germany: US 8th Air Force bombs strategic targets in Germany. Six members of a B-24 crew shot down near Hanover are beaten to death by a mob of German civilians led by sisters Margarethe Witzler and Kathe Reinhardt. One of the victims, left for dead in the pile of battered bodies, survives to tell the tale. After the war, seven of the mob, including the sisters, are sentenced to hang by a US military commission. Germany: Distrustful of the Army, Hitler orders construction of a new Westwall (what the Allies call the Siegfried Line) under Nazi Party supervision. Russian Front - North: Day 15 of 28 of the Battle of Tartu in southeastern Estonia. The Soviets reach Tartu. Russian Front - Center: Day 28 of 32 of the Battle of Kaunas, Lithuania. Russian Front: Day 9 of 12 of the German Operation DOPPELKOPF in Lithuania. This was mounted to restore the connection between German Army Groups North and Centre. Russian Front - South: Day 5 of 10 of the Battle of Romania, 2nd Jassy Offensive. Romania declares war on Germany. The Romanian Army blocks the Germans from entering Bucharest. They Luftwaffe responds by bombing the Royal Palace. Russian Front - South: Soviet troops capture Kishinev, Moldova. MTO: US 15th Air Force bombs targets in Czechoslovakia, Yugoslavia, Hungary and Italy. CBI - Burma: Day 146 of 302 of the Chinese Salween Offensive. US 10th and 14th Air Forces provide air support. CBI - China: Day 2,606 of 2,987 of the 2nd Sino-Japanese War. Day 130 of 259 of Japan's Operation ICHI-GO. PTO - Caroline Islands: US planes hits targets on the Truk Atoll. PTO - Dutch New Guinea: Day 54 of 61 of the Battle of Noemfoor. Although the island has been declared secured, bitter fighting from Japanese continues. PTO - Mariana Islands: The US Navy bombards the Japanese positions on the Aguijan Islands. PTO - New Guinea: Day 254 of 597 of the Battle of New Britain. US 13th Air Force provides air support. PTO - New Guinea: Day 125 of 481 of the Battle of Western New Guinea. 5th Air Force provides air support. PTO - New Guinea: Day 72 of 80 of the Battle of Lone Tree Hill. PTO - New Guinea: Day 46 of 47 of the Battle of Driniumor River. PTO - Philippines: The US submarine USS HARDER is depth-charged and sunk by Japanese warships off Dasol Bay. China: The Kukutsu POW Camp in northern Formosa (Taiwan) is closed. Japan: Japan agrees that the first Allied troops on their homeland will be paratroopers. CBI - China: Day 2,971 of 2,987 of the 2nd Sino-Japanese War. Day 16 of 25 of the Soviet Invasion of Manchuria. One of the great remaining controversies of WWII is whether the bombing offensive against civilians in Germany and Japan was a crime against humanity or if it was justified by the necessities of war. 1976 film of the passionate, tumultuous, scandalous, hilarious and utterly unlikely romance between beloved screen stars Clark Gable and Carole Lombard. Their weapons and ammunition were negligible at first, but slowly these amateur soldiers began to produce professional results.